The first day of racing at the second Les Voiles de St. Barth dawned with 25 knots of tropical tradewind breeze and showers sweeping over the picturesque French island located midway down the Caribbean chain. The regatta’s fleet of maxis, racing and cruising yachts, multihulls and classics – 48 confirmed on race day – set off on a race course around the nearby archipelago, and met with plenty of wind and bumpy seas, especially on the islands’ exposed eastern side. You certainly couldn’t have asked for a prettier race course, which today sent fleets on jaunts of either 16-, 22-, or 25-nautical mile jaunts. Most intriguing was the trip around the northern tip of St Barth and through the nearby archipelago, which in a typically French way makes one ready for a meal with names such as Ile Chevreau (baby goat), Ile Fregate (bird), Ile le Boulanger (the baker), Ile Fourchue (fork), Grouper et Petite Groupers (fish), Le Boeuf (beef), and Le Pain du Sucre (sugarloaf). Today’s later start at 1300 did nothing to diminish the wind and sea, as the first two classes off – Maxis and Multihulls – with 11 boats, started in 22 knots and encountered two meter seas and were sent on a 25-nautical mile course. George David’s Rambler 100 with Ken Read as skipper, got away at the pin end of the starting line to lead Hugo Stenbeck on Genuine Risk up into the outer harbour to an offset turning mark. 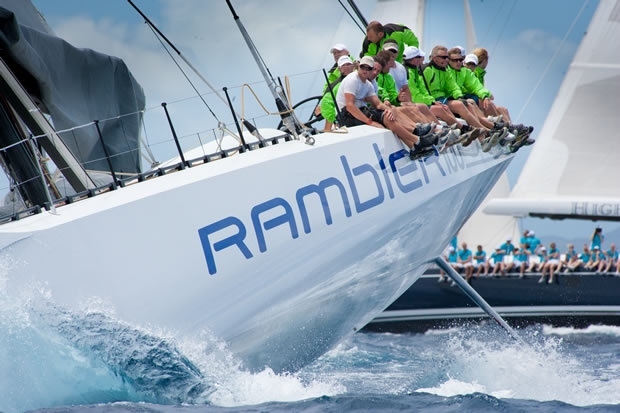 Once around, Rambler set a huge asymmetric spinnaker and was on her way for the day. On the eastern, and windward, side of the island the big boats reveled in the conditions which eventually topped out above 30 knots – Genuine Risk, with their combined Swedish/American crew, recorded 30 knots of boat speed surfing downwind through the islands. In the 24-boat Racing Cruising class, the Swan 60 Fenix closely led Jereon Hin’s First 50 Black Hole (NED) after the first upwind beat. This class has a gamut of boats including two all-women entries, Annie O’Sullivan’s Diamonds Are Forever (UK), and Henneke Stegweg’s iLost (NED). As well, there are two Moorings 50.5 charter boats with two crews from Oakville, Ontario, Canada, headed up by Andre Beese and Patrick Festing. Both crews are comprised of friends and fellow Etchells sailors, who were originally headed to Antigua to race when a friend suggested they race at Les Voiles de St. Barth. The Classics class, while low on numbers with just five boats, were high on style points with the 76ft W-class White Wings, the 80ft Fife yawl Mariella, the 60ft dark-hulled gaff-rigged yawl Kate from St Kitt’s, and the 26ft Friendship sloop La Sirene, gracing the line. Mariella was designed by Alfred Mylne, and built by Fife in Scotland in 1938. As Falcone says: “The beauty of this boat is the mix of the two." Mariella is well sailed and immaculately maintained, and Falcone says, “I believe the more you use the boat the better it is. But it’s never-ending work – not buying the boat, but keeping it. They say, ‘the owners are just taking care of the boat until the next one.’” His regular crew is a mix of family and friends including his daughter Sylvia, his long-time navigator, 89-year old Henry Pepper, and crew from Italy, Australia and Dominica. Les Voiles de St Barts is a way to prepare the boat for this summer’s classic yacht series in New England. Racing continues on Friday and Saturday with a first warning signal at 1100. The closing ceremony and fireworks will follow the awards ceremony on Saturday, April 9.